This is Ray’s new resting place since the move. 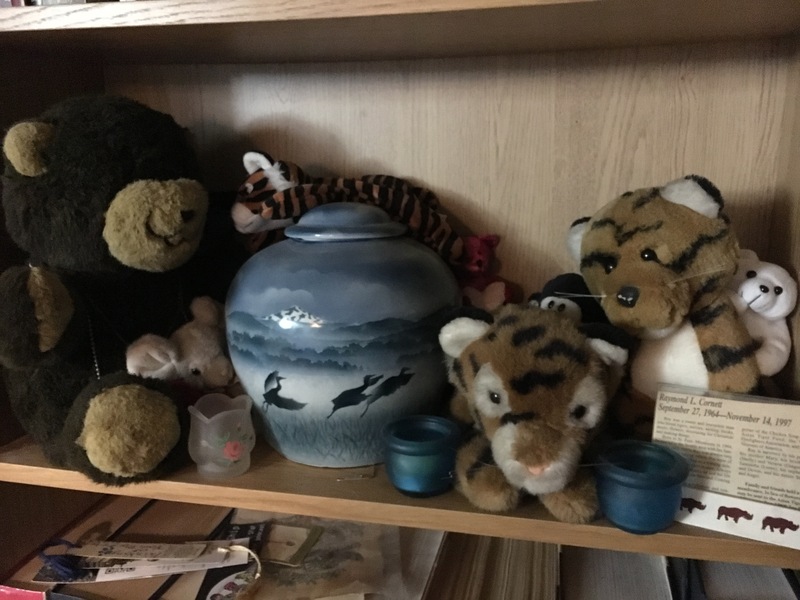 His urn guarded by teddy bears, tigers, penguin, and a mouse. I keep trying to finish some more posts about writing, but between the actual writing and real life, there hasn’t been as much time for the blogging. Among the real life issues I always have to deal with this time of year is a kind of seasonal depression. Not really seasonal, at least not in the sense that it is triggered by neuro-chemical responses to changes in sunlight. The approach of my birthday always reminds me of my late husband, Ray, since his birthday is just a couple days after mine. His birthday was a great excuse to get him silly cards or new cute plushies and so on. And mine was a great excuse for him to give me many many cards (so many cards—I learned early in the relationship it would never be a contest, he would always find a half dozen more great cards for me for any occasion) and silly toys and so forth. So the usual pattern is that around the time I realize that my birthday is coming up (which is also the beginning of Gene-Isn’t-Allowed-To-Buy-Himself-Things Season) until the anniversary of his death mid-November, I’m more prone to feeling down, being cranky, and getting deeply sentimental and/or crying over inconsequential things. This year has, thus far, not been too bad. Yeah, there’s still a month and a half to go, but usually if it’s a bad year I’ll have had several bouts of surprise cries by the time his birthday gets here. This year, it’s just been a little tearing up over things. 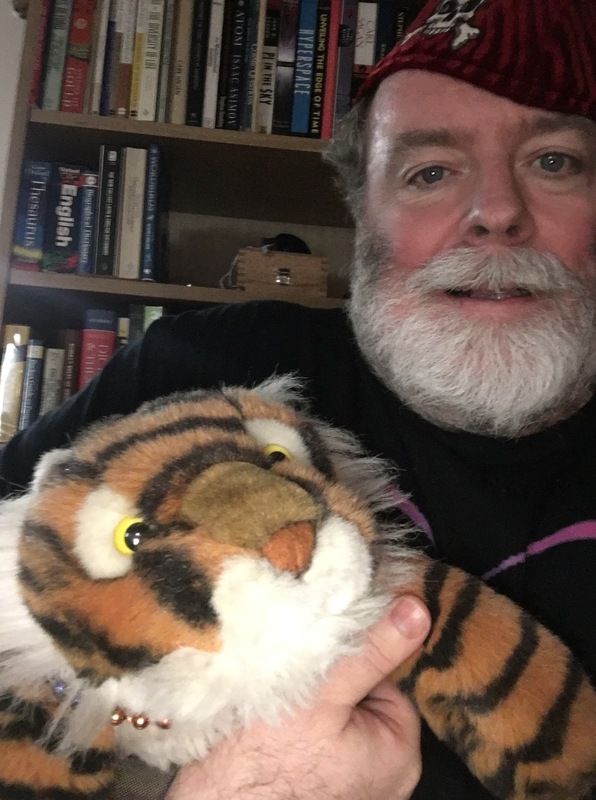 Floppy tiger makes the best helper! I had thought the mood swings and depression might be worse this year, since this is the first fall since Ray died that I’m no longer living in the last home we shared together. That hasn’t been the case. Perhaps because sentimentality is often triggered by familiar sights and sounds. When I step outside on my way to work each morning, for instance, I don’t see the rose bush he planted any longer. I will say that one of the advantages of the new place and the way we have replaced some furniture has given me a great opportunity to put a lot of the plushies in new locations. And because many locations are determined by the size and pose of a particular plush to fit at a particular place, that’s brought a bunch that used to be half hidden at the old place out where they’re easier to see. And because at the old place we tended to leave a plushie where it was until some compelling reason arrived to rearrange a bunch, the ones I’ve owned longest (and therefore are most likely to have memories of Ray associated with them) were more often half buried by others. Maybe the new setting is why most of the random reminiscing has been of the warm fuzzy feelings kind and less of the sobbing in sorrow sort. In any case, if Ray were here, about this time tomorrow he would be asking me, “So, how are we going to decorate for Halloween?” It’s because of the way Ray encouraged the kitschy decorator in me that I’ve long referred to the entire period from late September through at least New Year’s (and often all the way until Easter) as Decorating Season. That’s right! It’s not just Halloween and Christmas we can decorate for! Decorative gourds and cornucopias and cartoon turkeys can be deployed during November, hearts and cupids or just red and pink roses from late January until Valentine’s day, then you have St Paddy’s and Easter. I probably won’t go all out on all of them, but I see that several of our neighbors have already put Halloween things in their windows, so I need to get at least my new Spooky Banner that I bought last year (And because the building was being shown to prospective buyers, I wasn’t allowed to put up until the day before Halloween) up where people can see it. Amy and I spent the week together, and one of the things we did was go to storage (which is almost dwindled down to not needing a separate storage location!!) to grab the Halloween decorations. Due to the time of year we moved, I had Christmas and it’s already here at the house, but Halloween wasn’t. And I admit I’ve been eyeing the “fall” decorations for generalized Thanksgiving, also.